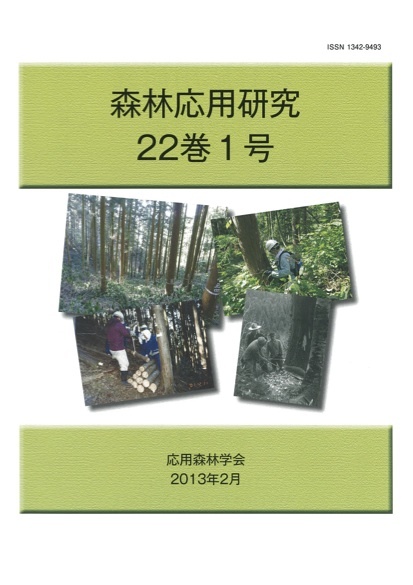 Abstract: The effects of clear-cutting on the decomposition of Camellia japonica leaf litter were investigated in a temperate secondary forest. We focused on the pattern of occurrence of bleached area on leaf litter and the decomposition of acid-unhydrolyzable residue (AUR), which included lignin and was known as a limiting factor of decomposition. Fallen leaves of C. japonica were characterized by the occurrence of bleached portions attributable to colonization of leaf tissues by ligninolytic fungi and decomposition of AUR. The litterbag method was used to follow an 18-month decomposition in a clear-cut (CC) and an adjacent control (CO) plots. Mass remaining of leaf litter was significantly higher and bleached area on the leaf surface was lower in CC plot than in CO plot. AUR content was lower in bleached portion than non-bleached portion. Among explanatory variables in generalized linear model, bleach and accumulated mass loss significantly explained AUR content that was response variable, but plot did not. These results suggested that the clear-cutting affected the rate of extension of ligninolytic fungi responsible for increasing of bleached area but did not affect the activities of fungi to remove AUR from leaf tissues. The reduced mass loss of leaf litter and the suppression of expansion of bleached area in CC plot could be partly due to that the changes in microclimates of the forest floor such as desiccation that would suppress extension of hyphae of ligninolytic fungi. Abstract: Patterns of occurrence of endophytic fungal taxa were examined for leaves of 73 deciduous tree species in a cool temperate forest in central Japan. A total of 15 fungal genera were encountered on 730 leaves collected in August 2008, with Colletotrichum being the most frequent genus, followed by Geniculosporium, Xylaria, Phomopsis, and Nigrospora. According to the genus composition of endophytic fungal assemblages on leaves, the 73 tree species were generally classified into a continuum with two types at the ends. The first type included tree species with endophytic fungal assemblages dominated by Colletotrichum and associated with Xylariaceous and other genera as relatively minor components. The second type included tree species with endophytic fungal assemblages of Xylariaceae and/or other genera as major components and associated with minor components with, or without, Colletotrichum. Relative frequencies of fungi were not related to the subclass or phylogeny of tree species.